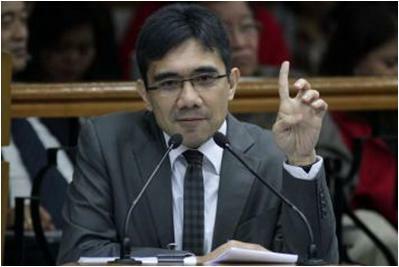 MANILA - The Office of the Ombudsman has ordered the filing of two counts of violation of the Anti-Graft and Corrupt Practices Act, one count of malversation, and one count of malversation through falsification of public documents against former Iloilo Rep. Niel Tupas, Jr. for the supposed anomalous use of his 2008 Priority Development Assistance Fund (PDAF). Also included in the charge sheet are National Agri-Business Corporation officials Alan Javellana, Rhodora Mendoza, Romulo Relevo, Ma. Julie Villaralvo-Johnson, as well as Kabuhayan at Kalusugang Alay sa Masa Foundation, Inc. project coordinator Marilou Antonio. According to the Ombudsman, Tupas requested the Department of Agriculture (DA) for the transfer of P5 million to National Agri-Business Corporation (Nabcor) for the implementation of his PDAF projects supposedly for his chosen NGO. The funds were supposed to buy hand tractors, water pumps, and grafted fruit seedlings but the Ombudsman found that Tupas implemented "ghost projects" as mayors of Ajuy, Batad, Estancia, Lemery, San Rafael, and Sara denied receiving any of the farm implements. The Ombudsman also said the liquidation documents submitted by respondents were fabricated, with Tupas himself allegedly signing the list of beneficiaries of equipment and seedlings from his district. In the resolution, Ombudsman Conchita Carpio Morales said that "to be able to repeatedly release substantial funds from the PDAF, access thereto must be made available, and this was made possible by Tupas, Jr. who directly chose and endorsed his own NGO to implement his PDAF-related projects." Tupas said he is "very surprised" by the Ombudsman's action because he has alerted the Commission on Audit regarding these "spurious documents." He also said he is eyeing to file a motion for reconsideration. "I'm very surprised by the resolution of the Ombudsman in that case because from the very beginning I took positive steps to inform the COA and the government agencies concerned when I received information that spurious documents allegedly containing my signature were being used to facilitate the release of government funds," he said in a statement sent to the media. "I was the one who alerted COA about it and I asked the government agency concerned to withhold the release of fund( some of the funds were in fact returned to the national treasury because of my letter complaint). I also wrote the Ombudsman informing the office of our discovery of spurious documents that were used to facilitate the release of fund." "I will ask my lawyers to file an MR and I hope the Ombudsman will see the light," he added.